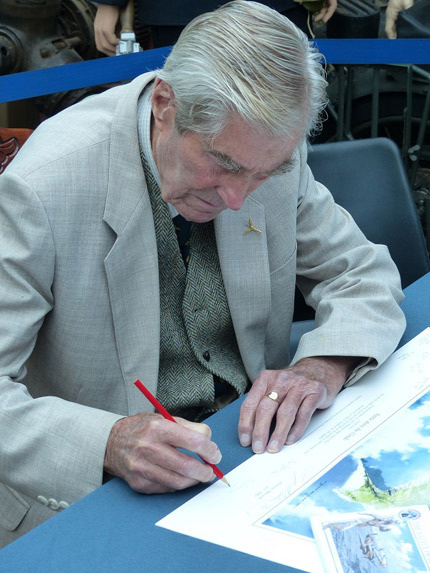 It was a proud privilege on Saturday 8th October for the Museum to welcome Wing Commander Paul Farnes DFM, a veteran of both the Battle of France and the Battle of Britain as a Hawker Hurricane pilot with 501 Squadron. The signing event was a great success with visitors travelling from near and far to meet Wg/Cmdr Farnes and have him sign books and prints. The question and answer session that followed afterwards was well attended with Wg/Cmdr Farnes in fine form to make the whole day a great and memorable one. Written on Sunday, October 23rd, 2016 at 7:51 pm.